Man's fascination with flight comes to life at this First and Second World War airfield. Here you can explore an aviation collection that is one of the best in the UK, discover extraordinary flying machines and find out how flight has changed our world. A site steeped in history, East fortune Airfield in 1919 saw the R34 Airship take off on its record breaking, first east-west, transatlantic flight. Now home to Scotland's Concorde, the arrival of this famous aircraft, at the museum, marks an exciting period of redevelopment, with new displays and interpretation, a new shop, dedicated learning centre, a bigger café and an exciting exhibition, The Concorde Experience, including on-board tours of the aircraft. You can also enjoy a fun-packed programme of special events throughout the year. Have you experienced jet travel? Take a look at the UK's only Boeing 707 cockpit and cabin. Step inside and see what it was like to travel on board! Discover how the aircraft was made and watch interviews of passengers and crew. Uniforms, baggage trolleys, airline jet engines and an airport fire engine all help tell the story of the airline that ushered in the 'Jet Age'. 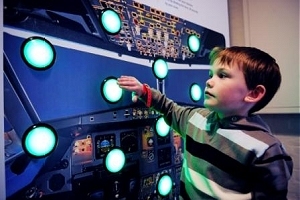 Fantastic Flight gives you the chance to get to grips with the mechanics of flight in our new hand-on interactive galleries. It also features over 25 activities where you can feel the force of lift, discover what planes are made of and test your own skills. We also have flight simulators where you have the chance to land an aeroplane and find out if you can fly solo. The Fortunes of War exhibition provides you with the opportunity to discover what it was like to serve at East Fortune airfield at different times in history. You can learn how the airfield has changed with our interactive map, navigate an airship to find the enemy submarine and watch historic film footage. Get a first-hand look at what life was like on an active airbase with models, aircraft parts, uniforms, and flying equipment. All of these exciting things give you a very personal sense of what life was like at East Fortune. Guide dogs, hearing dogs & other recognised assistance dogs admitted. The Museum is 20 miles east of Edinburgh, off the B1347.